Imperial Beach Firefighters were Out In Force Today Supporting the SD Burn Institute's 18th Annual Countywide Firefighter Boot Drive! Imperial Beach Firefighters were Out In Force Today at the Corners of 13th Street & Palm Avenue to Supporting the San Diego Burn Institute's 18th Annual Countywide Firefighter Boot Drive! Today, Thursday March 9th, IB Firefighters were out at the corner of 13th Street and Palm Avenue helping in the San Diego Burn Institutes 18th Annual Boot Drive. From 7am to 9am, firefighters were filling their "boots" with donations from drivers and their passengers as they drove through the intersection there. fundraising event with firefighters stationed at over 100 intersections ready to collect donations in their boots during the morning commute (and some will be out during the evening commute in other communities). 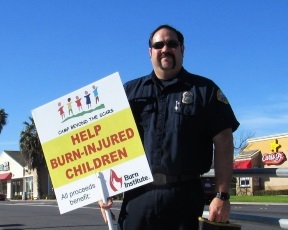 The Burn Institute is a nonprofit health agency dedicated to reducing the number of burn injuries and deaths in San Diego and Imperial counties. Founded in 1972, one of the Institute’s first accomplishments was to help establish the UCSD Regional Burn Center. 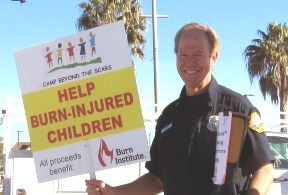 Today, the Burn Institute continues to: reach thousands of children and adults each year with lifesaving fire and burn prevention education; fund vital burn research and treatment; and conduct burn survivor support programs that help children and adults cope with the devastating psychological and physical effects of their injuries. One of the things the SD Burn Institute does every year is put on an event called "Camp Beyond the Scars". Every year since 1987 the camp brings children between the ages of 5 to 17 years old together. These children have all suffered traumatic burns. The camp brings them all together for a week of fun and a chance to be with others who have been through these traumatic experiences together. 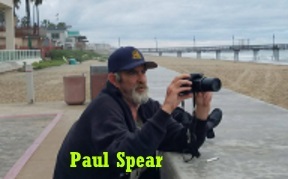 So when you see them out at the corner of 13th and Palm Avenue on Wednesday March 9th, please be prepared so you can give generously! This is one of the largest annual fundraisers for the Burn Institute and they are so grateful to the community and our fire service for their amazing support! !